Based on the play by Harold Brighouse, Hobson’s Choice is the story of a boot shop owner in Victorian England who copes with his eldest daughter’s decision to live her own life and marry his boot smith. Directed by David Lean and screenplay by Lean, Wynyard Browne, and Norman Spencer, the film is an exploration of a man coping with changes as he tries to maintain his own ideas while his daughters would rebel against the old rules. Starring Charles Laughton, Brenda De Banzie, Daphne Anderson, Prunella Scales, Richard Wattis, Derek Blomfield, and John Mills. Hobson’s Choice is a riveting and delightful film from David Lean. Set in the late 1800s at Lancashire, the film revolves a boot shop owner whose life is about to change when his eldest daughter decides to marry his best boot smith and start her own business after hearing that she is considered too old to be married. It’s a film that play into this man who is quite pompous and often quite selfish as he pays more attention in going to a pub to drink rather than give his daughters the freedom to make something of themselves. Even as his best boot smith is feeling unappreciated for his work when a posh customer commends his work but still gets underpaid. The film’s screenplay doesn’t just explore the ideals of Henry Hobson (Charles Laughton) but also someone that wants to operate everything from his business to his life at home a certain way. Even as he wants his two youngest daughters to be married but with men of his choice rather than their own choice while his eldest daughter Maggie (Brenda De Banzie) is thirty-years-old as he think she’s too old to get married and would rather have her run the business and household which she’s good at. 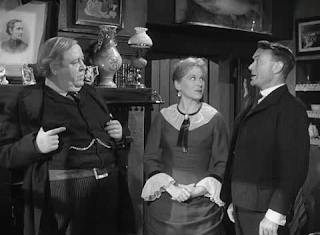 When Maggie hears what her father has said about her to his friends at the local pub, she realizes that she has to do something for her own independence where she forces her father’s best boot smith in Willie Mossop (John Mills) to marry him and take part in a partnership where he would make the boots and she would sell them and run the business. It’s a move that shocks her father who tries to move on without her but both Alice (Daphne Anderson) and Vicky (Prunella Scales) have a hard time trying to run the household and the business. One of the unique aspects of the script is the developing relationship between Maggie and Willie where even though it’s the former that is doing all of the decision-making. It’s Willie who would become much smarter and more confident as he starts off as someone with little ambition but through Maggie’s patience in educating him and learning bits about the business. Willie would come into his own while Maggie finds an equal in her life which would inspire Alice and Vicky to find men that they want to marry in their own terms. It’s something that Hobson would struggle with but also his own negligence towards his daughters and the fact that he’s an alcoholic. Hobson is a very unique character who is either oblivious in his selfishness or stubborn in his refusal to accept the changes around him. Especially at one point where he goes to the pub because the dinner Alice and Vicky made for him wasn’t satisfactory to his liking as it would play into the fact that times are changing and all of his bad vices and behaviors is catching up with him. David Lean’s direction is definitely mesmerizing not just for its sense of theatricality since much of the film is shot in soundstages with some of it exteriors shot in old areas in Manchester where the film is partially set. While there are some wide shots to establish some of the locations, Lean would go for something that is more intimate in its visuals in the way he captures life at the shop as well as the raucous world of the pubs. The direction also has Lean create some moments that are quite surreal as it relates to Hobson’s alcoholic state late in the film such as a scene early in the second half where he sees the moon reflected on puddles and tries to stomp them out. The direction also has a theatricality in some of the wide shots such as the very first time one of Maggie’s sisters sees Maggie with Willie as well as the day of their wedding dinner where Maggie’s sisters are with the men they want to marry. The direction also has Lean create moments that are quite humorous but in a very low-key way as it relates to Willie and the situation he’s forced into. Yet, even as he is developed into a more educated man with ideas of his own. There is still aspects of him that is quite simple where Lean would create a simple shot as it has something that is also very enjoyable. Notably the sequence of the wedding night where it’s about Willie trying to figure what to do while Maggie is in the other room. The film’s climax isn’t just about what Maggie and Willie had achieved but also a fall of sorts for Hobson who is forced to face reality about himself and the situation he’s in as it relates to his business. Overall, Lean crafts a witty yet whimsical film about a boot shop owner trying to deal with changing times and his own faults. Cinematographer Jack Hildyard does excellent work with the film‘s black-and-white photography from the gorgeous exterior shots in the park and in the day to some of the interior scenes at night including at the home/shop that Maggie and Willie live/work at. Editor Peter Taylor does superb work with editing as it is largely straightforward with a few rhythmic cuts for some of the film‘s surreal moments. Art director Wilfred Shingleton does brilliant work with the art direction from the look of Hobson’s boot shop and the basement where the boots are made to the pub where Hobson frequents at. Costume designer John Armstrong does fantastic work with the period costumes as well as the design of the boots that are made and the ragged suit of Hobson. The sound work of John Cox is terrific for the simplicity of the sound as well as the raucous atmosphere of the pubs. The film’s music by Malcolm Arnold is wonderful for its low-key yet playful orchestral music while music director Muir Matheson provide a soundtrack filled with the traditional pub songs of the times. The film’s incredible cast feature some notable small roles from John Laurie as Dr. MacFarlane, Dorothy Gordon as Willie’s original fiancée, Julien Mitchell as the pub owner, Gibb McLaughlin and Philip Stainton as a couple of pub regulars who are friends of Hobson, Jack Howarth as another boot maker at Hobson’s shop, and Helen Haye as the posh customer who appreciates Willie’s work as she would play an integral part in Willie and Maggie’s new business. Derek Blomfield and Richard Wattis are superb in their respective roles as the corn merchant Freddy Beenstock and the solicitor Albert Prosser as the two men whom Vicky and Alice, respectively, want to marry while they would also be involved with Maggie and Willie’s business. Prunella Scales is excellent as the youngest daughter Vicky who often does the cleaning as she also tries to cook for her father while Daphne Anderson is fantastic as the middle daughter Alice who knows how to run and manage the business but is aware that it’s not enough for her father. John Mills is brilliant as Willie Mossop as a boot smith who is good at what he does while he finds himself being in a business venture with Maggie where he realizes that he has a lot more to offer. Brenda De Banzie is amazing as Maggie Hobson as a 30-year old woman who decides to go into business by herself with Willie as she is someone with a lot of brains while realizing there’s more to Willie as she falls for him. Finally, there’s Charles Laughton in a phenomenal performance as Henry Hobson as a boot shop owner who prides himself in being the best at what he does but is often very selfish and often drinks himself unaware that he’s done a lot to hurt his family as well as be a fool to himself. Hobson’s Choice is a sensational film from David Lean that features tremendous performances from Charles Laughton, Brenda De Banzie, and John Mills. It’s a film that has a lot of wit but also a compelling story about changing times and a man’s selfish refusal to accept it. In the end, Hobson’s Choice is a spectacular film from David Lean.